After the vessel takes considerable damage in an ion storm, and a crewman is killed, the U.S.S. Enterprise takes an unscheduled lay-over at Star Base 11. There, Captain Kirk (William Shatner) explains the events leading up to the death of Lt. Commander Ben Finney (Richard Webb), and his actions in the yellow and red alerts. Specifically, he had to eject a pod monitoring the storm, and give Finney enough time to evacuate it, before jettisoning. Unfortunately, the Enterprise’s main computer records a different story, and depicts Kirk jettisoning the pod (and thus killing Finney) while the ship is still at yellow-alert. A general court martial is convened, and the most damning evidence comes from a machine: the Enterprise’s computer. Mr. Spock (Leonard Nimoy) soon realizes, however, that the computer has been tampered with, and that the computer tape extract is thus untrustworthy. This clue leads Kirk, Spock -- and indeed the entire court tribunal -- to the Enterprise to determine the real fate of Ben Finney. “Court Martial,” though not a great episode of classic Star Trek (1966-1969) is nonetheless one of the most influential stories in Trek history, and indeed, sci-fi TV history. Here, Kirk is hauled before a panel of judges because he stands accused of terrible crimes (negligence and perjury). It is up to his shipmate and friends, as well as an idiosyncratic lawyer -- played by Elisha Cook Jr. -- to clear his good name and save his career. 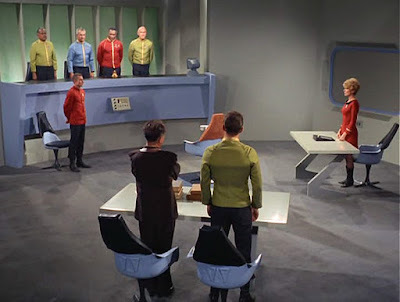 Although the wraparound story of “The Menagerie” -- which saw Spock on trial -- came first in the chronology, “Court Martial” is absolutely a foundational text for sci-fi television, essentially a Perry Mason episode in space, or in the future. Other series also went where Star Trek went before. Generally (and broadly) speaking, these are not particularly good or memorable episodes of their respective franchises. In part because the central Perry Mason dynamic is actually reversed. In Perry Mason (and other legal programming, like The Practice or Boston Legal, the criminal is a guest star, and the main or continuing character is the attorney. But in the sci-fi TV iterations, it is a central protagonist -- Kirk, Data, Riker, Dax, Paris, Starbuck or Buck Rogers -- who is hauled into court, or accused of a crime. 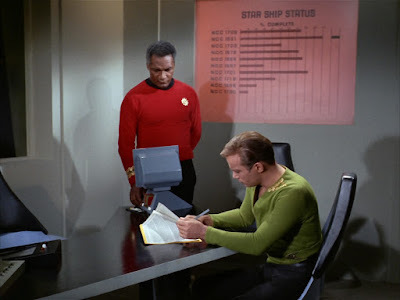 Some amount of tension or suspense is deflected because viewers understand the series is over if Kirk loses command, or Buck goes to jail, or Starbuck becomes a convict living on the prison barge. Also, audiences never really believe that Kirk is negligent, or Buck is a traitor, no matter what evidence happens to be presented/manufactured. So each such court-room story is its own little dead end, in a sense, with rare exceptions (again, “The Menagerie,” or the brilliant “Measure of a Man” come to mind) It all becomes a game of technicalities. How can Apollo, or Wilma, or Spock, or Picard find the evidence needed to exonerate a friend? What's the appeal? Well, court martial or trial shows are self-contained in some fashion. You need a court-room and not much else. “Court Martial” raises some serious questions of logic, believability and execution too. For instance, in any episode -- of any series -- about crime/trials, motivation is a key question. Here, Ben Finney wanted his own command, and to punish Kirk for the delay in that goal. Finney’s plan only satisfies one of those two agendas. If Finney is dead, at least according to Starfleet records, he is certainly never going to rise to be captain of a starship, is he? How did Finney expect to maintain the fiction that he had died? For the rest of his life, he would, by necessity, be an outcast from all his friends and family. As long as he was visible -- working, or just living in a region inhabited by Starfleet personnel -- his plan to ruin Kirk would be at risk. He would be discovered. Basically, he has given up his entire life -- friends and family -- just to get back at Kirk. Talk about wrath. This guy puts Khan to shame. Finney has eliminated the possibility of his own future for pure revenge. Secondly, the Enterprise -- and Spock -- can’t determine that the log entries or “record” from the Enterprise were edited? Today, we have digital footage with time stamps, and other ways too to get to the truth of whether or not visual footage has been manipulated to tell a false story. Similarly, what about the command chair/center seat instrumentation or unit itself, which should certainly be able to be accessed and the truth determined about precisely when -- and in what order -- Kirk activated certain switches? There ought to be redundant systems, so that contradictions can be reported. What if the button deice shows one thing, while the log entry recorder shows something else? This seems like it would be a crucial back-p.
Also, and perhaps most significantly, I can’t help but report that the episode’s theme is misguided and muddled, vis-à-vis technology (again) and its role in the 23rd century. Cogley argues passionately about man being de-humanized by his machines, by technology. He states that Kirk has never had the right to face his accuser: a computer. But the fact of the matter is that the computer was tampered with by a flesh-and-blood person, an act which showcases the dominance not of machines, but of man himself. Kirk stands trial not because a computer lies to the court room, but because a resentful man has the knowledge, imagination, and cunning to execute a scheme of lies and manipulation. 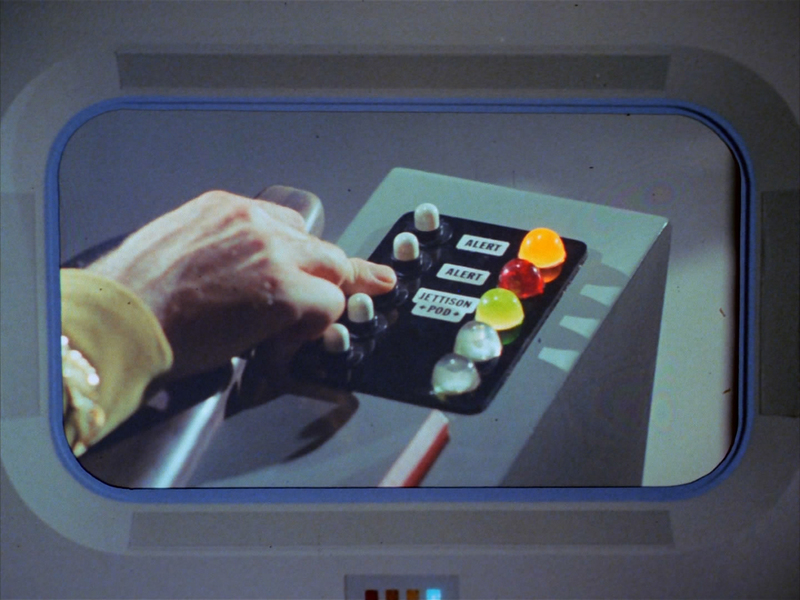 In fact, one might argue that it is technology itself that saves Captain Kirk, rather than trampling his rights. The worst prop in Star Trek history -- a white noise machine (actually a 1960s microphone) -- reveals the key fact that Finney is alive, and still aboard the Enterprise. It breaks the case wide open. It goes without saying, its a device...technology. And the computer’s failure to beat Spock at chess reveals to the intrepid first office that it has been tampered with (by a human). 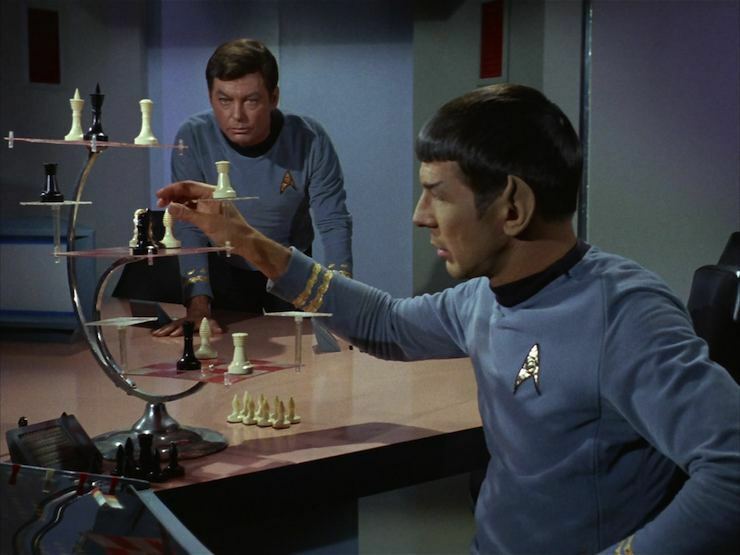 The key to exonerating Kirk in both instances rests with the use of or understanding of a machine. I sure hope in Finney’s defense, Cogley calls as witnesses the ship’s computer, and the white noise machine, since they -- by his way of thinking -- testified against his client (and saved Kirk). “Court Martial’s” idea that the “law” rests in printed books, but not in computer data repositories is also patently absurd, given what we know of technology, even today. Whole law books, unexpurgated, can be presented on the net, or read on a modern e-reader or iPad. There’s nothing de-humanizing or illegitimate about that fact. Sure, I love a printed book as much as the next guy, but the law isn’t located on “pages” made of tree pulp, it is located in the ideas and philosophies written down on those pages. Those ideas and philosophies can just as easily by discovered, explored, internalized, and synthesized on a computer or e-reader screen as they are in a dusty old volume. I totally understand why "Court Martial" applauds written books. This shows that Cogley is a quirky individual, and one who remembers the past. More importantly, the existence of these books says something about human beings in Star Trek's universe. History will stay with us. Comfortable things (like books) won't disappear just because the final frontier is opened. I get it, but I still don't think Cogley's case about the law being in books, not in computers, makes a lick of sense today. I love seeing an old book in Kirk's hands in The Wrath of Khan (1982), and it's an important statement that books 'survive' to the 23rd century. But the law is about ideas and ideals, not about how you access them. 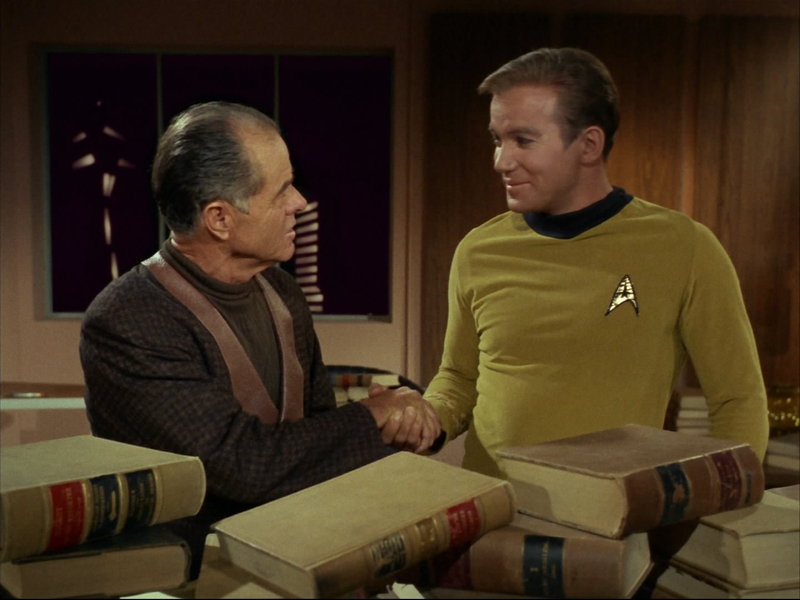 This episode also does a poor job explaining why Commodore Stone would prosecute Kirk so viciously. Kirk is, at this point, the youngest man to command a starship. He has stopped another war (“Arena,”) and a planned invasion by androids too (“What are Little Girls Made of”) too. And without even contemplating the idea that the log entries have been manipulated, Stone wants to stamp him down and drum him out of the service? Why? The episode never really makes the case for Stone’s hostility and closed-mindedness towards Kirk, especially given Kirk’s stellar record (as witnessed by the computer recitation of his medals and honors). To me, his zealous, antagonistic nature speaks to the sense of artificial drama I noted above. There's something not quite true or honest about how this episode is presented. It feels like a ginned up, gimmicky story, not an authentic one. 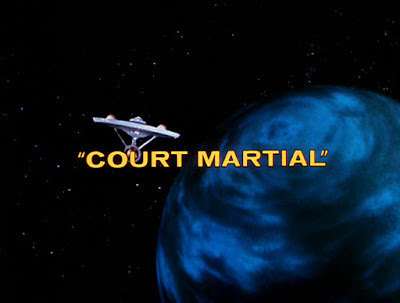 All this commentary is not meant to suggest that “Court Martial” is actually terrible episode, however, merely that the ideas it presents haven’t necessarily aged well. And, though it is not the episode’s fault, too many lazy writers have followed up on the outer space court-room milieu, usually as a budget saving bottle show. What works well in “Court Martial,” I would submit, is the close look at Kirk’s past, aboard the Republic, and the choices he has made. In particular, I like the scenes in which he describes his friendship with Finney, and his career in Starfleet. For me, the absolute best scene in the episode occurs when Kirk talks about his training, and his preparation for life-or-death moments and decisions. He states he has spent his whole life in preparation for such events, and worries that when one occurred…he failed. This is a potentially identity-destroying moment for Kirk, a possible negation that everything that he stands for. But even in this contemplation, Kirk is indomitable. He stops questioning, and refuses to believe that he made such a mistake. “Court Martial” thus shows his spine of steel. He may question himself and his choices, but there is also a point where he knows must trust -- if he is to continue as captain -- his ability to make a responsible decision. He is not a panicky guy, and so he knows the charges are false. I think "Court Martial's" failings are more to do with lousy execution than with its ideas being poorly presented. After all, the idea that technology might either run roughshod over us or be misused and abused to our detriment is hardly farfetched! The Wronged Man plot is always a good one for character examination and makes for great drama. The trouble is, this is a slapdash episode that doesn't quite do what it purports to do: Cogley himself, for all the talk of how great he is, doesn't do a damn thing--it's Spock who comes in with last-minute evidence of tampering that gets Kirk off. Thank heavens Cogley pulls himself together to make one helpful speech about how Kirk should be allowed to confront his accuser--the computer. Otherwise, he's completely useless. The story is shot full of holes (what was Finney going to do once Kirk was convicted? ), whips through some early plot elements that could do with further examination, then has a finale that goes on too long and wastes what came before. There are interesting characters and actors here, though, who could have done so much with a more tightly written script. 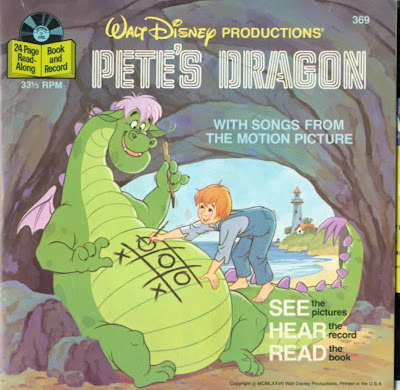 It all ends up being a neither-fish-nor-fowl episode that has elements of interesting character study in it. It could have been so much better. Honest review of “Court Martial”. Myself, I really like “Court Martial” because it gives us a sense of the greater Starfleet activities beyond the 1701.
the facts is quite another. hour being led through technicalties and legal gamesmanship. I agree with your assessment. Not the best episode, but interesting for its portrayal of life in the future, as SGB points out. Cogley, for all his faults, is a memorable character, and his speech is stirring. His angrily delivered "I DEMAND IT!" is really a great way to take us into the commercial break! A couple of light touches I appreciate in "Court Martial": The look on Kirk's face as Cogley intones "No further questions." The final time Cogley says this, Kirk might as well be thinking "Dude! WTF!!" I also enjoyed the reactions of Spock and McCoy after Kirk has kissed Lt. Shaw on the bridge. I wonder if Ben Finney ended up on Tantalus Colony?